If you indulged in Tuesday's There Will Be Days Like This, you may be concerned that we left Mom in the lurch with no refrigerator and a can of soup. "What happened?" we imagine you screaming. SFMOMA snap+share. Senior Curator of Photography Clément Chéroux (left) with starving artists. Well, we confess we left her to her own devices yesterday. She made tea and toast. "How did you make toast?" we asked, knowing she doesn't have a toaster. "In the oven!" she snapped, as if it were obvious. 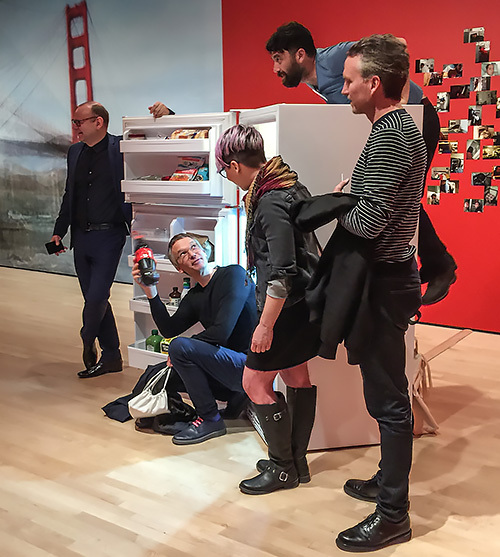 We had to zip down to SFMOMA (if you can call it "zipping" up Third St. these days) for a press preview of SFMOMA's snap+share exhibit, which opens Saturday. It beckoned as an escape from the crisis of the week. The theme, according to Senior Curator of Photography Clément Chéroux, isn't selfies, he said with a snarl, but transmission. Turns out we've been transmitting images for a long time. And the exhibit demonstrates not just the way artists have been doing it but how we're doing it now. That's "we" as in you, too. Because a number of the latter exhibits in the show invite you to take a photo and share it. We thought we had escaped the refrigerator repair follies for an hour but when we entered the central room of the show what should be find but what you see above: a refrigerator standing in the middle of the room. It's David Horovitz's idea of a photo opportunity. You take your photo inside or with the refrigerator and post it with the designated hashtag. Too funny, perhaps. We didn't even smile. We couldn't stay long because we had to make it to Mom's to meet the Alex, the appliance repair guy, at the house. And we did. He apologized for the bad news but it's the compressor, not the relay. Not feasible to repair. So we resumed our search for a new model that would fit in what was once a generous bay for a refrigerator. That one at SFMOMA would fit nicely, we think. Maybe we should set Mom up with an Instagram account.